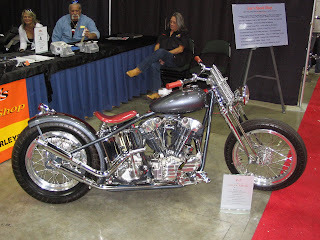 We are nearing a month since the Donnie Smith Bike Show was held in St. Paul this year. As usual, it was a huge success, and enjoyed greatly by exhibitors and spectators alike. This year's event drew over 16,000 through the doors. 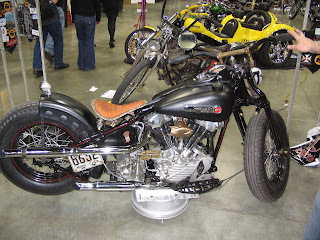 One of the neat things associated with the show, was that my friend and customer Joe had his Flathead Big Twin displayed there. 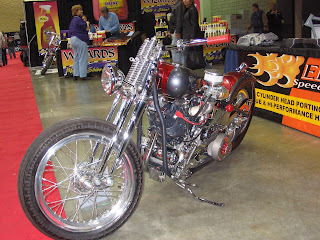 This is the bike who's engine was the subject of my series on a stroker Flathead engine build. Technically this was not its debut, since he rode it around Sturgis last summer, but certainly it was the first time it has been entered in a bike show. Congrats to Joe for taking home a couple trophies! His Flathead not only took best in class in the "Vintage Modified", but his display took an overall 2nd place for best display. 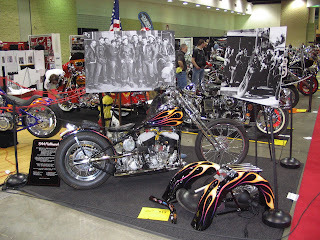 Joe's display featured blown up pictures from the movie The Wild One. My guess is that hardly anyone there caught on to all the details of his display. He even had a trophy made up with the character portrayed by Marlon Brando's name on it! Besides helping my friend Neil Ryan (the show's promoter) with set up, I also had a booth there to promote my business. Since the latest project bike I had in the works was nearly done, I spent the extra time to finish it up for the show. While I decided to display it in my booth rather than enter it in the show, I must say it received rave reviews. In case anyone is interested, P2 (as I refer to it) is an 80" Knuckle using S&S flywheels and a Paughco frame; for sale at $23,900. Here are a couple pictures. Check out the Holley downdraft carb! A few other bikes which I had at least a small hand in over the last year are pictured below. I fit the main bearings on Jason's Pan. He took it from there. Kevin's Knuck motor was completely rebuilt in my shop, finished just in time for the show. Hard to believe that just 2 weeks prior to the show I was replacing the exhaust spigots on Dave's Pan. Kokesh did the balance of the work. Have you ever considered what the actual compression ratio of your motor is? Are you sure that you took everything in to account or are you going by the rated compression ratio of your pistons? The simplest way to measure the actual compression ratio of your engine is to have it assembled, at TDC, and then "oil out" (old school term for measuring the volume) the combustion chamber. But to do this you must also be able to position the engine so that the spark plug hole is at the very top of the chamber so that you don't get an air bubble trapped which would throw off the measurement. Pretty awkward to say the least! Every other method involves measuring separate components and calculating the ratio mathematically. Here are a couple of things to consider when doing so. This formula is especially handy for an old time Harley guy like me since you enter the specs in inches, and the constant (12.87) converts the answer to cubic centimeters. The normal way to cc a Shovel, Pan or Knuck head is to place a piece of Plexiglas with a small fill hole across the gasket surface. When you do this you will be measuring not only the chamber, but also the space into which the fire ring on the cylinder fits. That means that the volume that the fire ring displaces must be calculated and subtracted from the head volume. Treat the fire ring as a cylinder and use the formula above. To get the cc's of the fire ring it is only necessary to calculate once using the o.d. of the fire ring and then subtract the volume found using the i.d. Think of it like another really short cylinder and use the above formula to compute the volume. If your piston only comes within .010 of the top of the cylinder, it is just like running a .010 thicker gasket. This can often be found in manufacturers specs, but not always. You can grease the piston rings, install the piston into the cylinder so that the top of the dome is just below the cylinder top, and then measure the distance down to the deck of the piston. This will serve as the height inserted into our magic formula above, which allows you to use the bore diameter to compute the volume of the cylinder formed from the piston deck to the top (if it did not have a dome in it). Once you have that volume you can oil it out and subtract to get the dome volume. How far the valves were sunk into the heads from previous valve jobs. Now, if you just finished oiling out your heads, this is of no consequence in computing your actual compression ratio. But it will help explain why your compression ratio is not as high as your piston manufacturer claims. Low and behold our handy dandy little formula comes to the rescue again. If you use the valve diameter in the formula along with the amount that the valve is sunk deeper than the minimum spec as the height, you might be surprised how much compression ratio you loose. This is especially relevant on the older motors which usually have a lot of valve stem protrusion and the valve un-shrouding which often accompanies it. In performance applications, the valves often have to be sunk to maintain valve to valve clearance with the hotter cams that are available, so that is also something to take into account when selecting your cam and pistons. Now perhaps you think all of this doesn't much matter on your average cruiser. Well, maybe. On the other hand, keep in mind that higher compression ratios make a more efficient engine, and thus better fuel economy and power. On the other hand too high a ratio can lead to hard starting and worse yet, pinging. Another consideration is that all cams have a compression ratio range that they will work the best in. It is beginning to look as though the time for nostalgia drag bike racing may be nearing. Most people are aware that nostalgia drag racing for cars is already a big deal and has been for a few years. However, I have not been aware of much in the way of nostalgia drag racing as far as motorcycles go. There are a couple events coming up that will hopefully change all of that. 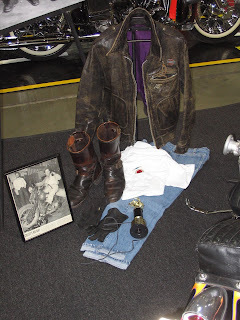 This spring at the V-Twin dealer expo in Cincinnati, my friend Watso of Axis 101 Motorcycles in South San Francisco, introduced me to Marty, the man who runs the AMRA (American Motorcycle Racing Association). The dialogue was about the feasibility of vintage motorcycle drag racing. Since then, Marty has called me to confirm that he has decided to add 3 vintage classes to the Sept. 6-7 Pacific Junction, IA, AMRA race. A vintage fuel class, a vintage gas dragster class, and a vintage street class. This is going to be done on an experimental basis, to see if it generates any interest. Only trouble I can see is that Marty seems to be leaving it a well kept secret. I have yet to see it on the AMRA website let alone anywhere else. If you are reading this Marty, the word needs to get out pretty quick if any old codgers are going to be able to clean all the dust off their dragbikes by then. Watso also called me recently to let me know about another race or interest going on out in California. This one looks to be basically a nostalgia drag race run the way they were in the old days; cars and bikes at the same event. Dragfest looks to be a pretty cool event with several classes for vintage dragbikes. It is coming up mighty quick (May 3&4) at Famosa Raceway. Now I have my own ideas on how and why some venue for nostalgia motorcycle drag racing could be a success. For one thing, drag racing never completely gets out of your system. Secondly, most of us that spent a considerable amount of time on the drag strips of this great country back in the old days have little interest in spending their summers in a points chase. But, they could likely be lured back for one weekend a year, just for old times sake. I have to believe that there are plenty of vintage dragbikes that have survived in various stages of disrepair in their owner's garages or shops. After all, there never was a very good market for racing equipment that was no longer state of the art. It also seem to me that there may be a new interest in third party "restorations" or fresh builds of vintage style dragbikes. By third party, I mean something on the order of what I am hoping to accomplish in gathering parts and info on a drag bike from an era earlier than mine. I know that I am not the only one with such aspirations. I have a friend who has never raced, but has been collecting parts for a Shovelhead drag bike. The toughest part may be to get the word out. That is why I am asking anyone reading this who knows any old retired drag racers to point them in my direction. I was just going to let this go. Lick my wounds and forget about it, so to speak. But they just have to keep running ads on my radio. Constantly. You might think that after all these years I would have learned a lesson. After all, its not like I have never made the mistake of contracting to have some work done without inquiring the price, and then had a severe case of sticker shock when the bill came. And I even remember telling myself to NEVER do it again without at least a ballpark estimate. But I did. In my own defense I made the assumption that since H&R Block is a large company, and did a lot of advertising, their obvious volume would lead to low (or at least competitive) pricing. As usual, an assumption cost me hard earned money I would not have had to spend. So, two hours of copying my figures (already categorized) onto their computer comes to over $800. I just wonder if that is enough to teach me a lesson I won't forget? While doing a little research on early motorcycle drag racing I cam across this site with pictures from 1964 Lions Drag Strip. I thought it was pretty cool and thought I might show you a couple teaser pictures to entice you to click. 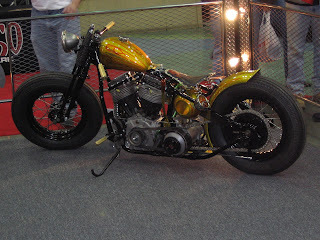 The name of the site is HotRods Bikeworks. In a previous post regarding my interest in building a nostalgia dragbike, I told of my purchase of a blower that had been used on a Knucklehead dragbike here . After receiving the blower and through further discussion with the party I purchased it from, I was put in contact with the original owner. I hoped that I may have purchased a part that came from an old dragbike which it might be possible to re-create. It had not really even crossed my mind that it should be a significant piece of drag racing history. Of course that would have been a plus, but I would have been quite satisfied just to find that the blower was from a '70s or earlier dragbike that had a little local history. Well, I must say that I feel as though I have hit the mother lode! Not only is the blower from a bike with a history, that history goes back to the very beginning of organized drag racing itself! As stated in previous posts, this S.Co.T. blower came off of a Knucklehead dragbike named the Gorilla, owned by Don Jones. A Google search really didn't give me any info on the Don Jones I was looking for, at least that is what I thought. The name came up in regards to motocross; obviously a different Don Jones. Wrong! When I called Don, he told me that he was pretty busy for the next few weeks since a documentary was being done about he and his family's involvement in the origins of motocross racing. It seems that Mr. Jones has a history of being involved when and where racing history is being made. 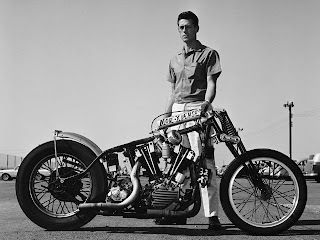 Apparently his bike, "The Gorilla", was only one of a pair of Knuckle dragbikes running out of his motorcycle shop in 1949 and the early 1950's. 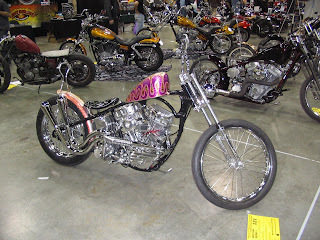 The other bike was Chet Herbert's "The Beast"! 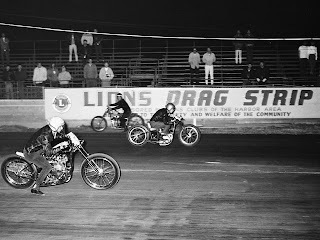 The dragstrip they frequented was Santa Ana, which, from what I understand, was the first track to ever have a weekly drag race schedule. Now "The Beast" is one of the most famous of the very early drag bikes. Of the first 19 events held at the Santa Ana strip, The Beast ran the meet's top speed 6 times (this included both bikes and cars). There is a some irony in the fact that the Knuckle dragbike which I campaigned in the mid to late 1980's was also named "The Beast", but that is another story, for another time. 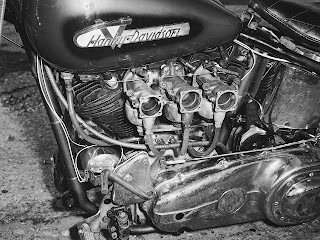 In speaking with Don Jones via the telephone recently, I found him to be a veritable treasure trove of information about these early dragbikes. With absolutely no hesitation he was able to rattle off details even down to the number of teeth on each sprocket of these bikes. Wow. I must admit that many of the details from my own racing career are fading fast, and those are from only 23 years ago. Sacrifice is an important theme throughout the Bible. This past Sunday morning at the Donnie Smith Bike Show in St Paul, my wife and I attended a short service put on by the St. Cloud chapter of the Bond Slaves MC. This is a group of Christian bikers who I have had the pleasure of getting acquainted with through this show. Bruce, one of their prospects, delivered a fine sermon drawing parallels between the sacrifice of Christ for our freedom from sin and the servicemen who often are called upon to sacrifice themselves for our freedom. The fact that Jesus went willingly to the cross, suffered and died for us is incomprehensible to some, but in reality it is not an act that is unheard of. The stories of soldiers who have given their lives to save their buddies is not such an uncommon one. Most parents would die in place of their children. Consider that terrorists all too often sacrifice themselves for a false god. What really struck home to me, though, was the picture Bruce painted of God the Father, knowing the torture his Son would endure, still sending Jesus to be sacrificed. One of the points that Bruce brought out was that the parents of these servicemen are also facing the very real possibility that their own sons or daughters may die for their country. That of course is where the analogy breaks down. Parents of servicemen are always hoping and praying that their loved ones will not have to suffer or die for their country. God the Father willingly sent his Son knowing full well that he would suffer and die. That's a love that is difficult for us to fully grasp! Remember to pray for our men and women in uniform and their parents and families!